While this growth in life expectancy and the number of seniors living in Toronto is positive, it has significant policy, service and resource implications for the City. In particular, the way the City organizes its housing and services for seniors does not currently meet their needs, a problem which will be exacerbated over the next 10-15 years. With more than 40 City services for seniors delivered by 13 City divisions, agencies and corporations these services need to be coordinated and made more accessible. The Toronto Seniors Strategy Version 2.0 articulates 27 recommendations including 18 short-term and 9 medium-term recommendations. The short-term recommendations were included in the 2018 City budget. City Council directed City staff to report back on the financial impact of the medium-term initiatives in 2019. The first progress report on the current Senior Strategy will be submitted to City Council or Committee in early 2019. 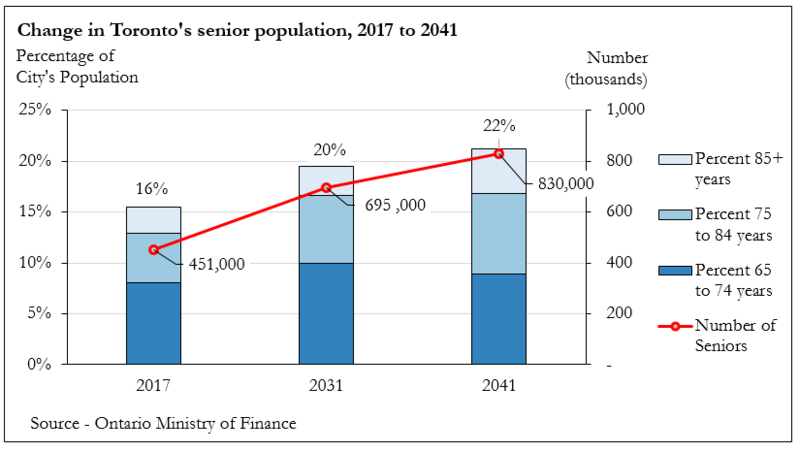 Population projections show that Toronto needs to be prepared for a greater number of seniors. In 2017, 16 percent of the city’s population was 65 and older, a number expected to increase to 22 percent in 2041. The City views the growth of the aging population as a positive development. At the turn of the twentieth-century life expectancy was 51 years; it is now 81 years and growing. Seniors are a valuable asset to Toronto, bringing energy and lived experience to the city’s diverse communities. The City needs to plan and strategize to ensure the needs of this growing population are met. City initiatives to support seniors must take an equity approach to consider the diversity and disparities in lived experience that exist among seniors. The City is addressing the policy, service and resourcing challenges of a growing senior population through a range of interrelated programs and services addressing health and wellness, housing, transportation, employment and income, and access to information about services and programs. These programs and services are outlined in a continuously updated Toronto Seniors’ Strategy. City Council approved two strategies. The first strategy, adopted in 2013, established new measures for accountability and monitoring to ensure that City commitments related to seniors would be implemented. The second strategy (Version 2.0), adopted in 2018, focusses on providing better coordination of service delivery, with a particular core focus on housing for tenants age 65 and over, as housing affordability declines dramatically as a person ages. As a result of its Seniors Strategy, the World Health Organization designated Toronto an Age-Friendly City in February 2016. In 2018, City Council unanimously adopted an updated Toronto Seniors Strategy Version 2.0. with 27 recommendations that builds upon the 2013 Toronto Seniors Strategy. Version 2.0. reiterates the City’s commitment to ensuring seniors’ needs are met and that Toronto seniors are supported to live full, healthy lives. Given the significant issue of housing affordability for older tenants, housing is a core focus of the updated strategy. City staff are focused on implementing the updated Seniors Strategy’s 18 short-term recommendations. To support implementation, City Council directed City staff to establish a Seniors Transition Office and to develop recommendations for a new Seniors Housing and Services Entity responsible for strategic planning, connecting and integrating services for seniors, and maximizing the use of existing resources to meet the current and evolving needs of seniors. The Seniors Transition Office will develop and recommend an approach for the strategic integration of the 83 seniors-designated buildings within the Toronto Community Housing Corporation portfolio with the Seniors Housing and Services Entity.